On September 11-12th CDFA will bring together state and local government leaders, businesses, and citizens from around the world to share innovative and transformative achievements related to climate health and food production. 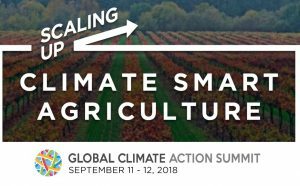 The Scaling-Up Climate Smart Agriculture event connects farmers and ranchers; multinational corporations; foreign governments and non-governmental organizations (NGOs) to further the role that food and agriculture have in climate discussions. The event will combine panel discussions and tours related to soil health and climate smart agricultural practices and the role of sustainable procurement, technical assistance, and policy to help farmers rapidly scale up practices. California’s uniqueness as a specialty crop producer makes these discussions all the more important. Day One (Sept 11)– will focus on farming practices, land conservation, sustainable sourcing and public policy. Notable international and national speakers include Jimmy Emmons; Emmons Farms; Zwide Jere, Total LandCare (Malawi); John Piotti, American Farmland Trust; Keith Kenny, McDonalds; Jerry Lynch, General Mills; Tina May, Land O’Lakes; Tom Rosser; Agriculture and Agri-Food Canada; and Paul Luu, 4 per 1,000. These speakers will be joined by a host of California’s voices including: Diana Dooley, Office of Governor Edmund G. Brown, Jr.; Jocelyn Bridson; Rio Farms; Soren Bjorn, Driscoll’s; Glenda Humiston, University of California; Katie Jackson, Jackson Family Wines, Richard Rominger, former CDFA Secretary and many others. Notable guests include Senator Bill Dodd. A ‘California Conversation’ Tuesday evening will bring together Ann Veneman, former Secretary of the U.S. Department of Agriculture and past Executive Director of UNICEF; A.G. Kawamura, former CDFA Secretary; Kat Taylor, founding director of TomKat Ranch Educational Foundation; Don Cameron, president of the California State Board of Food and Agriculture and CDFA Secretary Karen Ross. Other notable guests include Assemblymember Marc Levin; Caroline Beteta, Visit California; and David Festa, Environmental Defense Fund. Day Two (Sept 12)– brings the attendees to the farm, with tours of climate smart agricultural practices at work. Bordessa Dairy and Stemple Creek Ranch will be profiled operations where carbon farm plans, sustainability metrics and management practices will be discussed. Speakers include: Jarrid Bordessa, Organic Valley; Loren Poncia; Stemple Creek Ranch; Wayne Honeycutt, Soil Health Institute; Nick Goeser, National Corn Growers Association; Gabriele Ludwig, Almond Board of California; and Adam Kotin, Wine Institute. Notable guests include Sonoma County Supervisor James Gore. A complete schedule of events is available here.